o right, i need to update that, thanks! Is it alright to talk about sexuality? You did not say all that clearly whether this is acceptable or not to talk about sexuality in the rules. That is generally a bad idea. Allow me to explain why! Discussion of sexuality generally involves topics that are beyond the limit of PG-13, both idealistically/politically, and physically. PG-13 is also the MAXIMUM rating, but is by no means the general rating of the forums we run by (which is somewhere between PG and PG-13). It is okay to mention sexuality if the topic somehow goes there, but it's an unwise idea to go in depth about it. You're either privy to an as-yet undisclosed rules update or you're running a little behind. Heh, I should PROBABLY read these things before I join, huh? Never do, and I never have to worry about, because most everything I say is PG anyway. That is good, but you still should read all the rules. Not all of them are "No stuff over PG-13". I see. I do not want to start a topic on something which will be dominated by inappropriate posts and responces, before I found this webcomic I came across some research documents about the Furry Fandom and they stated that the Furry Fandom had a large minority of bisexuals and claimed that furries adopted a friendly and welcoming approach from their bisexual members. I wanted to clarify whether this might be true or false, that is all. I asked in this thread to make sure it was alright to discuss such matters before I asked anyone but since it is not then I will drop the subject. The furry population here is not a very good cross-section of the furry fandom anyway. That may be so but quite literally the furries on here are the ONLY ones I have ever spoke to properly, all others disappear when I ask them about the fandom because I am an "outsider", therefore there is still some things I do not quite understand or have been given false information. I wanted to ask these questions while I had the chance. I can't help you, since I am not even furry. And like Sleet said, this forum probably can't represent the whole furry fandom that well. However, like Buck said earlier, discussion of sexuality should be avoided. It is okay to mention it, but you will risk triggering undesired discussion if you go any further. So I afraid this forum is not the place for that kind of subject. I understand and I have officially dropped the subject, I will not mention sexuality again. Yeah, I read the rules yesterday. HP doesn't have near as many rules as the forum I was part of last. I think Rick was very fair about them. He just wants to keep the comic innocent and avoid too heavy of shipping. Okay guys, you see the little (!) at the bottom of every post? 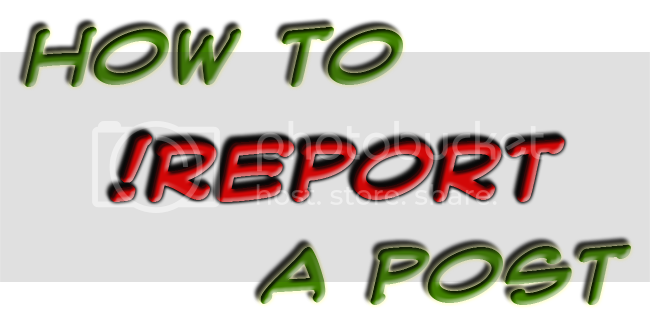 This is the report post button. It is highly useful to moderators, as it lets them jump to an inappropriate post in a thread. Things that are less appropriate: whining about inappropriate posts in a thread and hoping a moderator sees it, and complaining about it vocally on the IRC chat. Knock it off. I've felt like this forum's been getting too hot-headed as of late and everyone needs to cool off. I will be closing threads that border on outright insulting others if it goes on too long. Woo, now we have a report button! I'll make sure to use it every time I must! It's actually been there forever. The only thing is that no one ever uses it...until now! I didn't know about the report button until Rick mentioned it too. Me neither. I actually forgot forums had them because I've never needed it before. Hi, guys and gals, it's time for a Housepets! Forums ProTip! Last edited by Dissension on Thu Dec 02, 2010 10:11 pm, edited 1 time in total. shut up, jim-jim, nobody likes trolls. Is it just me or are the HP Forums becoming increasingly rulesy? Not that it's a bad thing that there are rules, but the situation can't be THAT bad. Then again, Buckdida has yelled at me multiple times for not adequately exploring the forums, so perhaps my naivete springs from the lack of exploration. Rules mostly come from necessity. When things get out of hand, rules need to be made. It's hard keeping a forum friendly and appropriate without quite a few rules, since people tend to be neither of those things on their own. Is it just me or are the HP Forums becoming increasingly needing of rules? The 'rules' used to be one guideline which was basically not to get too out of hand or be too silly. When the forum got bigger and people found that difficult to manage (subjectivity's a *****) rules were brought in – least, I assume that was the motivation, since at that point Rick was playing the part of every role. As new problems or things that could potentially cause problems come up, more rules are put into place regarding them. What about arguing about values? On another forum the "authorities" closed the thread because of this. Nobody was flaming, just discussing something (For five hours non-stop!). Well, maybe we derailed the thread a little bit. It's fair, as long as it's kept at the minimum possible level. I hate the tendency of rules put in for everything (somewhere else, by somebody else, in another situation). Re-checked the rules once more and i've got everything covered. Also, not to backseat mod or be a mini-mod, but isn't there a rule that there's "No one-word or single-image responses"? Cuz I've seen some posts (like the post above me) that's just one word and nothing more. Isn't that not allowed? Things like that probably won't be called out, because that would be even worse than the original one word post. But if you were to abuse one-word posts, you'd probably get a grumpy message from a mod. That's coming from me, not a mod, but something like that is probably why. I'm not sure if we've said anything about it. If not, then it's along the lines of an unspoken rule. It's still a rule, but it should be common sense that you shouldn't. It's a chat thread guideline at the very least. Per the first post of this thread, it is a "minor rule." No one-word or single-image responses (unless the topic is about those very things, naturally). This includes thread bumping; do not bump a thread unless you have something additional to contribute. Additionally, any topic likely to provoke such a response is probably forbidden from discussion here anyway. Just something I wanted a little clarification on. Does alcohol constitute a drug under this rule? I've seen people reprimanded for doing what amounted to mentioning the fact that alcohol exists, not even in the context of actual consumption. Okay, I suppose I just answered my own question there, but it never hurts to ask. I would say no, unless the discussion was directed toward encouraging or goading underage drinking.